The single most important factor in valuing antiques and collectibles is condition. Most items found in mint or near-mint condition will bring a much higher price than those with flaws. Still, it's very easy to overlook chips, cracks or other concerns that could be detrimental to a piece's condition while shopping, especially at live auctions where the excitement is running high. Just Why Is Condition So Important? It may seem okay to buy a damaged item, especially if you're just buying an item for your own enjoyment. But tastes change over time and collectors often find themselves selling to upgrade or move in a different collecting direction. In order to retain value, antiques should be purchased in very good to mint condition whenever possible, especially if you’re paying a premium price. Items with chips, cracks and excessive wear are worth a fraction in comparison their perfect counterparts, and selling damaged goods can be next to impossible with the exception of a few very rare items. Don't worry though. A few simple tests and tips can help you avoid expensive mistakes. To check glass for chips, gently run your finger around all rim, base and handle areas. This technique can also be employed for pottery, ceramics and other items prone to chipping. Take care if you feel sharp spots to avoid cutting your finger. Some types of damage can be repaired professionally, such as very minor chips on the rims of glass stemware, but it’s wise to steer clear of major chips. Always remember that repaired items will never be worth as much as a comparable piece in mint condition, and all repairs should be disclosed if you sell a piece that has been restored. Hold each glassware item to the light to make cracks more visible. This to be important when dealing with glass pitchers and other items with applied handles since they are prone to stress and often crack at the base of the handle. While some types of damage can be repaired professionally, cracks don't usually fall into this category. White porcelain will also reveal cracks when held to the light, and you can use a black light to detect glue used for many porcelain and pottery repairs. Ceramic items will also emit a dull sound, rather than a nice ring, when tapped with your fingernail if they are cracked. Place items on a flat surface before doing this sound test. Even plastics such as celluloid dresser items and Bakelite crib toys should be examined for cracks. Although they are less likely to be damaged than similar glass or porcelain pieces, they can still succumb to pressure when not treated with care. Basically, check everything very well before you purchase it. If it doesn't measure up to the price tag, leave it behind. Always inspect the surface of glassware for excessive scratching from utensils and other wear. Some dishwasher detergents can be very rough on glass causing permanent "etching" that is often an almost iridescent, film or clouding on the surface. This is seen fairly often on Depression glass, and referred to as "sick" glass. Sickness can be confused with surface dirt, so when in question wet the surface of the item to clean it. If the cloudiness wipes away, it’s just dirt. If it comes back as the glass dries, it's sickness (meaning that the glass is permanently etched) and virtually irreparable. Sometimes stubborn water stains inside of glass vases can be removed by using denture cleansing tablets. Water stains usually appear as a ring within the glass and only impact a small part of the overall piece. Most of the time sick glass will be cloudy all over. Make sure all parts are present and as near perfect as possible. 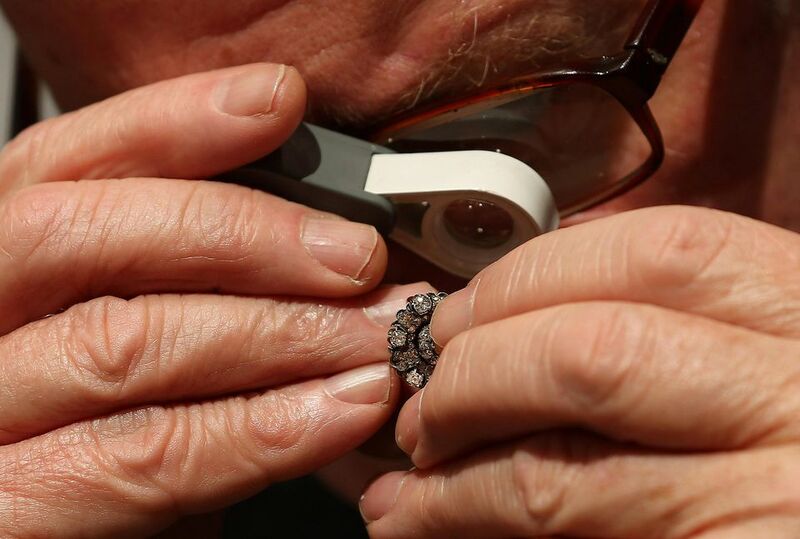 Jewelry, for example, should be checked carefully with a loupe or magnifying glass (as shown in the photo above) to make sure no stones are missing. Any repairs and replaced parts should be virtually undetectable to the naked eye without the aid of a loupe. Also be aware of "marriages" such as a stopper from one type of bottle paired with an ill-matched bottom, or a cup in one china pattern married with a similar saucer that isn’t a match. Anything that doesn't add up as original affects an antique's value. Is It Stained, Torn, or Threadbare? Vintage clothing items and linens are quite prone to showing wear. All textiles should be checked for stains, holes, and tears that can’t be easily removed or repaired, and excessively worn areas. Lace trims should be given the once over for holes and embroidery should be examined for loose, missing and faded threads. Vintage clothing should also be examined to make sure it is free of moth holes, faded spots and to determine that all the original buttons and trim are in place. Many vintage textiles were indeed used in the home and some have held up better over the years than others. The same holds true for vintage and antique clothes.